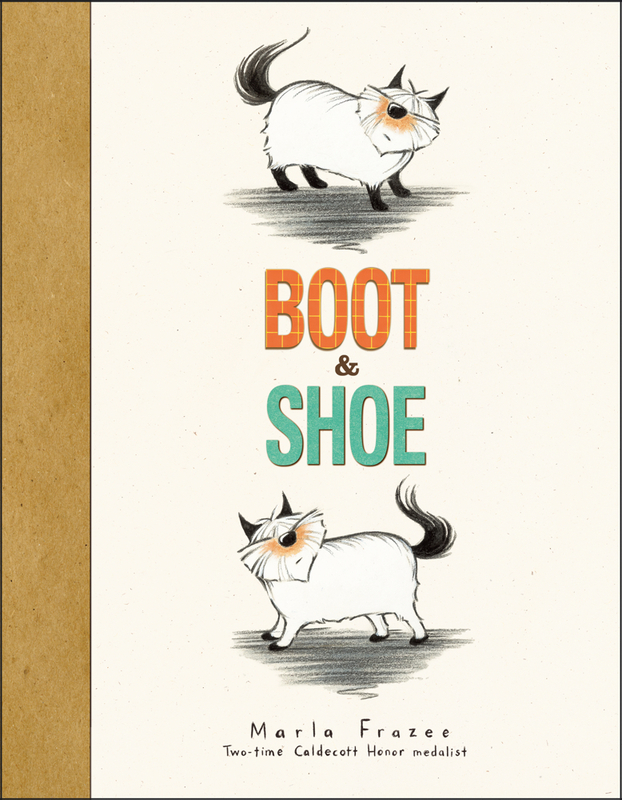 Luckily Boot and Shoe by Marla Frazee (Beach Lane Books, 2012) wasn’t snatched up this week. I’ve been wanting to read it aloud for awhile and this week’s dog-loving crowd was the perfect audience. It’s a story of two furry dogs who do everything together except nap. One loves the front porch and the other prefers the back. All is well in their daily routine until a trouble-making squirrel visits and a wild chase ensues. The dogs leave their respective porches to pursue the squirrel and wind up exhausted on opposite stoops, sadly not able to find the other…until they have to visit the usual tree. The families loved the double page spread that maps out paths of Boot and Shoe around the house chasing a squirrel! Five little kittens standing in a row. They nod their heads to the children so. They run to the left; they run to the right. They stand up and stretch in the bright sunlight. Along comes a dog who’s in for some fun. ME-OW! See those little kittens run! 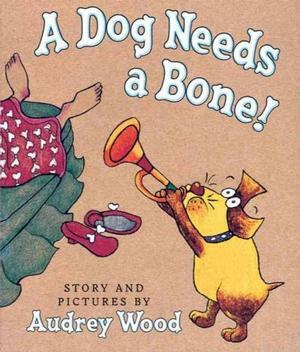 Our next book was A Dog Needs a Bone by Audrey Wood (Blue Sky Press, 2007). It’s rhyming text, lovable dog, and simple vocabulary make this a good choice with preschoolers. The story isn’t riveting, but it’s an enjoyable read aloud. I brought my dog Bingo along for the road trip this week to celebrate his 1st birthday. He came to live at the library last Spring and is a beloved addition to any storytime. Instead of singing happy birthday, we sang B-I-N-G-O using the felt board. See my Rhythm and Sounds post for all of the details. Using felt letters and turning over each one as we work our way through the song helps the little ones understand the pattern and rhythm while also providing opportunities for print awareness. 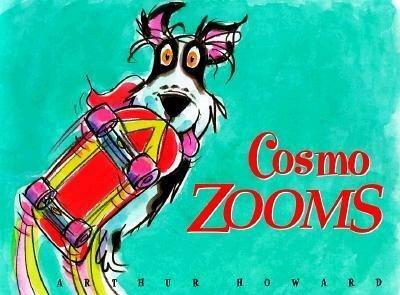 Our last book of the day was Cosmo Zooms by Arthur Howard (Harcourt Brace, 1999). After living in the shadow of the other Pumpkin Lane dogs and their special talents, Cosmo discovers his own talent, skateboarding! That is one special dog. I brought Smelly Bill by Daniel Postgate (NorthSouth Books, 2007) and See Me Run by Paul Meisel (Holiday House, 2011) which we didn’t have time for, but kids read them on their own or with adults after the craft projects were complete. Today’s craft I also found on Sturdy for Common Things. 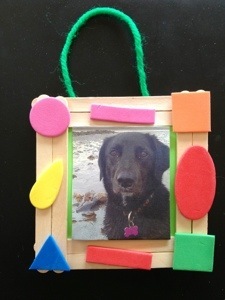 The pet photo frame was simple (easy for preschool age and younger), I had the materials on hand, and it got kids excited to find a photo of their pet friend or family member to put inside. My absolute favorite part of storytime this week was when this picture happened. This is the doing of one little boy is a reluctant crafter and his friend, a preschool age girl. The boy brings cars with him everytime, often gripping them in his had through out the stories and play that follows. 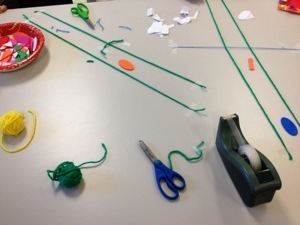 After his picture frame, he decided to make a road with the yarn on the table. We got it taped down and he got his car driving. The girl next to him wanted a road to, so we taped the yarn down for her. With no real cars to be had, she used the white peeled off backs of the sticker shapes we used for the frames. Each road eventually had a bridge and inspired lots of imaginative play!